It’s a familiar story; a child’s birthday, an outrageous present demand Any parent would go to the ends of the Earth to make their child happy on their birthday. However, when Catherine Wardle asked her son what was top of his wish list, she wasn’t quite prepared for the response. My eldest son, then quite young, decided he wanted a zebra. It isn’t the sort of request you would realistically expect to fulfil but Catherine had an ingenious solution up her sleeve. As a compromise we chose a stripy cat from the local rescue centre, she was a quirky soul and we enjoyed her personality. The new moggy adored Catherine’s sons and, after making the decision to home another cat, the Wardle clan were now intrigued by the prospect of becoming a family of breeders. We caught up with the working mum-of-two and Associated Cat Breeder to get the low-down on her story. We felt that a Bengal would be a good fit, said Catherine. They’re great. They need time, entertainment, company and stimulation. If they get all of this and plenty of love they are fantastic pets, extremely intelligent and can be easily trained. Purdy was the first feline to be chosen and they were so taken with her that the family agreed to try breeding one litter to see if it was the life for them. 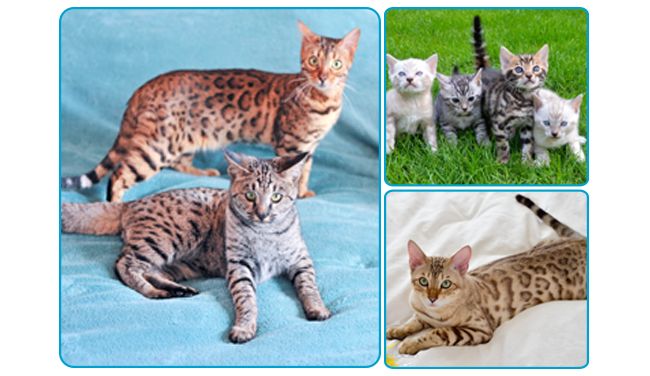 It certainly was and the Wardles have now been breeding Bengal cats for around five years. It was through this that Catherine and her family were introduced to the Savannah cat. We have fallen in love with our little lady. She is a chilled version of the Bengal and extremely chatty, enthused Catherine. Bengals and Savannahs are great pets in the right hands. Christmas is traditionally a hectic time for any family, and 2015 was busier than ever for the Wardles, as Catherine explains: We had one litter of Brown and Snows, all reserved and ready to move on to their new families, and another litter of five Snows that were just two weeks old. And that’s it as far as you re concerned? Oh no, we stay in touch with most people who have bought our kittens their choice! We have great feedback and we love hearing how well the kittens have integrated into their families. Breeding cats can be hard work and so the Wardles made a conscious decision to limit their litters at a frequency that was not only beneficial for the cats and the kittens, but also for their home life. For a while it was a challenge juggling family, home and work but additional support soon arrived in the form of another family member who also seemed to have caught the breeding bug. My Dad helps when he can, explained Catherine. He loves the kittens and gives them all names. The Snows are always Frank because of Ol Blue Eyes Frank Sinatra! The main thing for us is that we all enjoy it, the children get a lot out of it, and we get to meet some lovely people. And what about the gorgeous pictures of those kittens the family sent us? My husband! He loves photography and has always got a willing set of models!